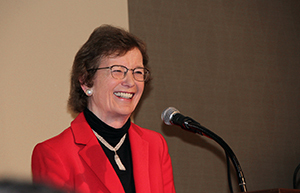 It was an absolutely enlightening speech on March 10th, at the I-Hotel in Champaign, when the Honorable Mary Robinson commented on the Paris Agreement and the challenges of climate justice waiting ahead for all of us. The keynote was part of the two days workshop, “Climate Change and its Impact: Risks and Inequalities” co-sponsored by more than thirty offices, colleges, departments, and centers at the University of Illinois, including the European Union Center. Last December in Paris, 196 heads of states attended the COP 21, the United Nations Climate Change Conference, in order to negotiate an agreement aimed to reduce and eventually stop climate change. The Paris Agreement sets important goals and measures that will become binding if signed by at least 55 countries that are producing overall more than half of global emissions. In the opinion of the Honorable Mary Robinson, the Paris agreement delivered what was expected. 188 countries committed earlier to the UN and intensive, yet transparent work of governments, civil society and businesses – with small countries involved in the process since the very beginning of the “road to Paris” – have helped to agree on strong countermeasures to one of the plagues of our century. The outcome of COP21 is a large, binding agreement that still minds national conditions and differences, but unlike the previous agreements and protocols, attributes a share of responsibilities to all the countries involved. Among the main goals of the agreement is a drastic reduction in carbon emissions containing the increase of temperature to a 1.5 degrees Celsius limit as compared to pre-industrial levels, marks a fundamental turn in the optic of saving our future generations. However, there are still a few adjustments that are required to the agreement. The provision of implementation and enforcement measures are two of them. For instance, authoritarian regimes may represent an obstacle to its effectiveness. Another problem related to implementation is the absence of financial support to help developing countries to be compliant, since technical measures may be too costly and not affordable for them. In general, we took big steps forward, and we may look to 2030 with excitement and hope, a word that the Honorable Robinson repeatedly stressed during her speech. The future of the next generations is in our commitment to reduce carbon emissions and fight climate change. The Paris Agreement was a clear sign of this commitment. Carlo Di-Giulio is a MAEUS student and graduate assistant at the European Union Center.